Traditionally, a return ticket from place A to place B allows a passenger to travel from A to B and back from B to A. 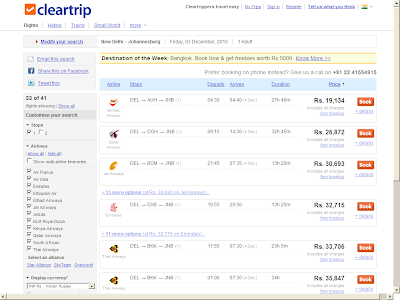 It's no news that a return ticket between A and B is usually significantly cheaper than two individual tickets (A to B; B to A). However, the traditional concept of a return ticket assumes that a passenger disembarking at B will board, a few days later, from B. What if B is in a different country, and the passenger travels to a location C in this country using the road, and wants to fly back to A from C? The traditional concept of a return ticket doesn't apply here, and sometimes a passenger is left with no inexpensive choice. The best way to explain this is with an example. 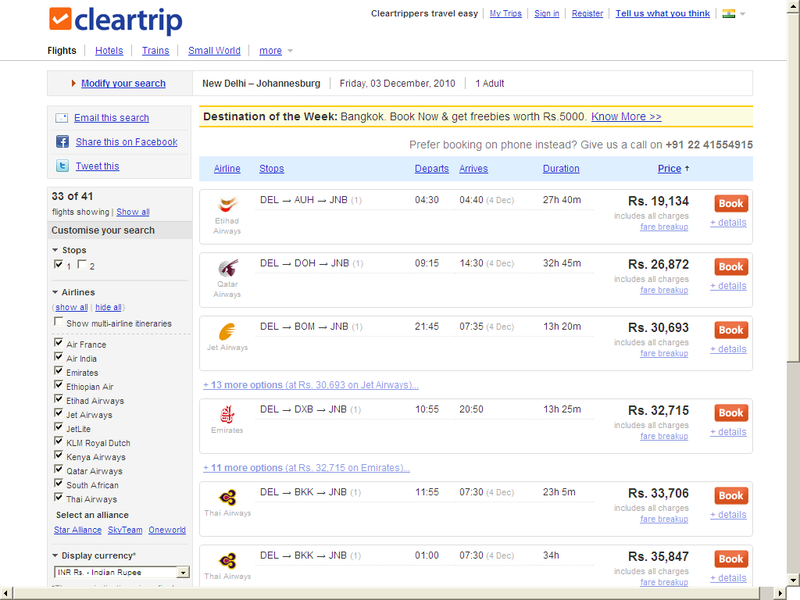 An Indian wants to experience South Africa, and wants to take a flight from Delhi to Johannesburg. He wants to roam Jo'burg for 2 days, before making a quick hop by the road to Durban and Kruger (another 3 days). Upon returning, he then wants to fly from Jo'burg to Cape Town on a local airline, and experience Cape Town for 3 days, before taking a flight from Cape Town back to Delhi. 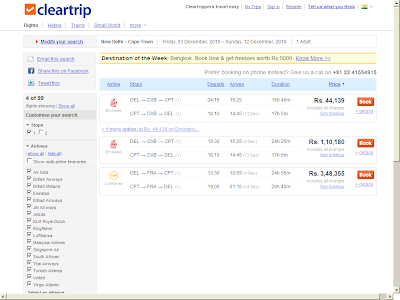 The current model of return ticket doesn't apply in the above scenario, a scenario which I believe is a quite common passenger requirement, and such a traveler will have to shell out a total of INR ~63,000 for the DEL-JNB and CPT-DEL flights on Emirates. 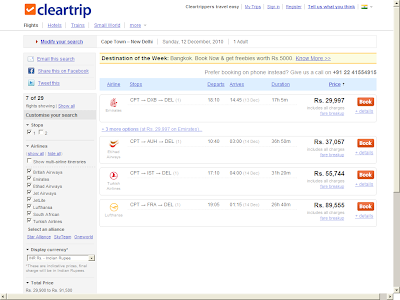 However, both DEL-JNB-DEL and DEL-CPT-DEL flights on Emirates are significantly cheaper (INR ~44,000 each) than the DEL-JNB plus CPT-DEL combo on Emirates. Why? 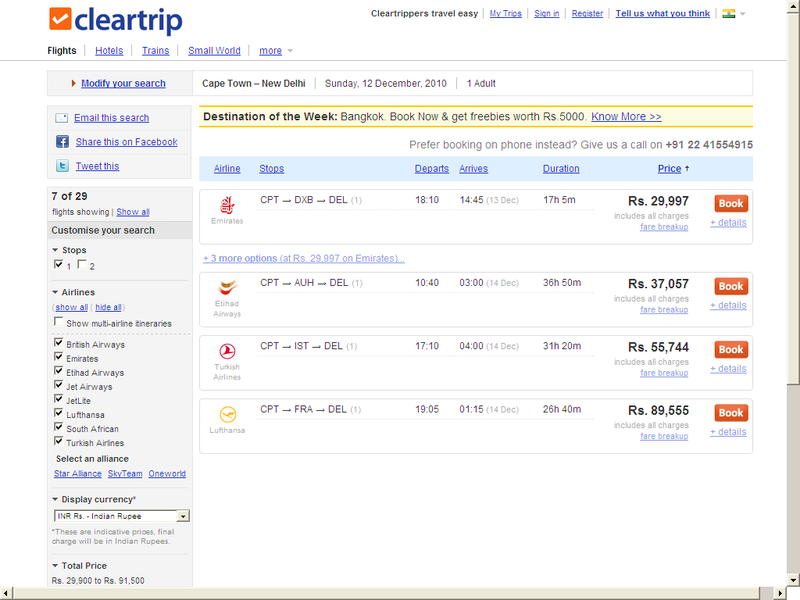 Because DEL-JNB with CPT-DEL doesn't qualify as a return ticket. 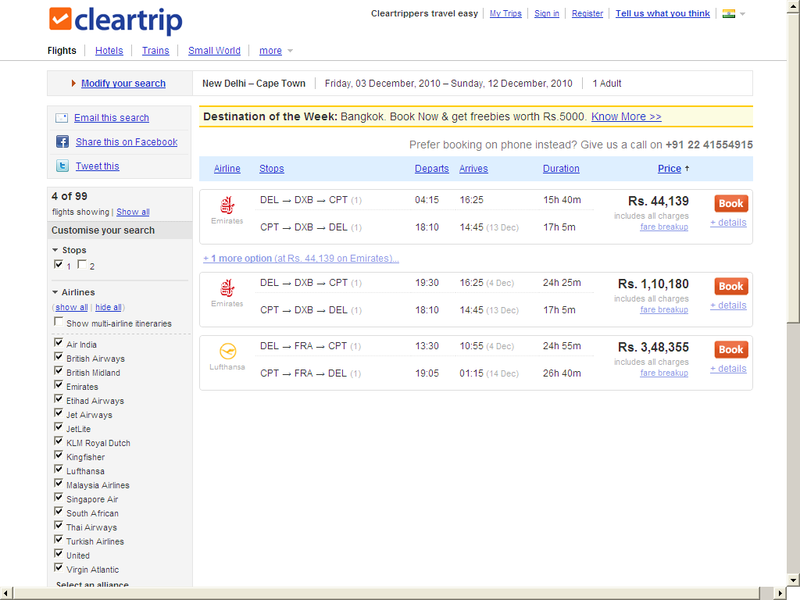 This is unfortunate, because from an operational perspective, DEL-JNB-DEL and DEL-CPT-DEL journeys don't give any extra benefit to Emirates, compared to the DEL-JNB plus CPT-DEL combo. That is, for Emirates a DEL-JNB-Missing-CPT-DEL journey by a passenger is not significantly different from a regular return ticket journey by the same passenger. And so, I believe that there's an opportunity for airlines to launch a new type of return ticket called Nearby Return Ticket (NRT). NRT will allow a passenger to get the benefit of significantly lower overall price of a regular return ticket, as well as the flexibility of arriving at and departing from different destinations that are nearby. 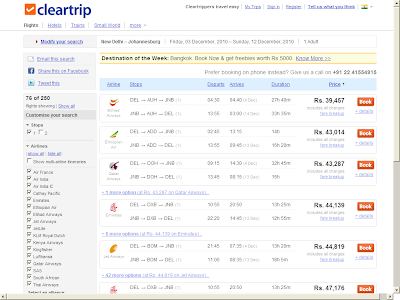 For example, Emirates will allow a passenger choosing the DEL-JNB-Missing-CPT-DEL type journey to fly for INR ~44,000 using NRT (or INR ~49,000, if Emirates wants to make a few extra bucks for providing the NRT service), instead of INR ~63,000. After all, when it doesn't make any/much difference to an airline from an operational perspective, there's no reason why an airline shouldn't be willing to give a passenger the fare of a regular return ticket on NRT too.